By Jake Rocheleau in Coding. Updated on November 12, 2017 . Almost everybody in the business section has created a resume at some point. When working as a freelancer you are always vying to land new projects. Because of this transitory work cycle it helps to offer potential clients a brief peek into your past experience. And what a better opportunity than offering your professional resume online? In this tutorial I want to demonstrate how we can build a responsive single-page resume layout. I’ll be coding everything in HTML5/CSS3 to work properly at various screen resolutions. The resume will also support microdata powered by schema.org for more technical SEO advantages. 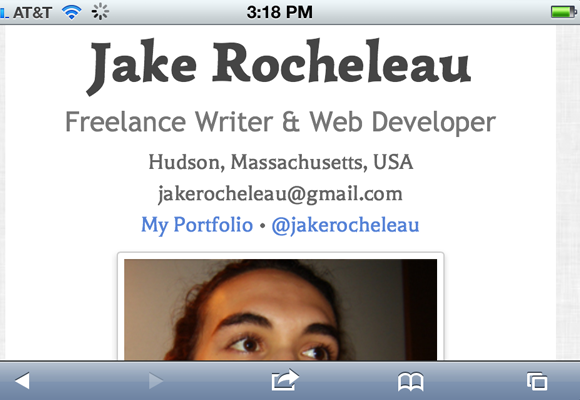 I’m starting the webpage with an HTML5 doctype and standard meta elements. But to get this layout responsive we’ll need to setup some additional components. Most of these are typical meta tags and will be supported in all modern-day browsers. The meta viewport tag is crucial for getting the responsive technique to work on smartphones. We reset the scale as 1:1 so the layout is displayed pixel-perfect. You’ll also notice I have included an external stylesheet from Google Web Fonts. I’m using two custom typefaces “Simonetta” and “Balthazar”. Unique fonts certainly grab your visitor’s attention and fit harmoniously into a single-page design. The whole document is wrapped in a div with many various block sections inside. The top <header> tag includes my photo, name, e-mail address, and other important metadata. Afterwards I’ve broken each block into a <section> element for the rest of the content. As you resize the page these block elements fall beneath each other gracefully. I’ve setup a few different instances of media queries in an external stylesheet. This makes it easier keeping track of styles when going back to edit something later. Before we jump into detailed CSS I want to explain more about the use of microdata. If you look closely I’ve littered attributes inside many different elements with the names itemtype, itemscope, and itemprop. These all relate to the Schmea project which hopes to offer a data structure for the web. All of the major search engines including Google, Yahoo!, and Bing have accepted Schema as the best syntax for data markup. By labeling details about yourself it helps these search engines display related results for your content online. Let’s break down how to set these up. The itemscope attribute is applied to any container which holds information on a schema item. This is always followed by the itemtype attribute, which in this scenario is describing a person. Inside this wrapper div I can label any content by using itemprop along with any of the details listed on their documentation page. The recommended method is to wrap your content inside a span tag instead of appending directly to the element. When you’re labeling something like a photo you should attach itemprop to the img element directly. But otherwise you’ll have much cleaner markup by wrapping your data in span tags. I would argue that there is no limit to the amount of detail you can go into. Microdata is available to help computers recognize people, organizations, products, and other items within an online context. The more information you can offer, the better. When listing my various skills I’ve setup a new container defining the ItemList schema. There wasn’t any type of skillset or experience to list under a Person, so this is a safe alternative. The value here is that Google can understand each itemListElement is related to each other. In this case we have a list of languages and software I know how to work with. Another good example is the articles listing found at the very bottom. There is a schema setup for articles and blog posts, all related to content found online. I’ve indicated the article URL and date of publication which is more than enough info for these search engine crawlers. Just keep in mind that microdata is all about formatting content to be organized by computers. This single-page resume is the perfect example to define traits about a specific person. These aren’t going to be useful on every website, but it’s an exciting methodology to understand. In this last section let’s take a look into how to style this whole webpage. Towards the top of our stylesheet I’m defining some initial resets and basic element properties. These include headers, list items, and anchor link hover effects. Nothing too interesting except for some of the custom font stacks. I also grabbed a unique bullet icon instead of using the default “disc”. You can try searching through a directory like Icon Finder when trying to locate a similar design. There are only a few important block areas on the page which require attention. Of course the wrapper div is setup with extra margins and padding. Also the max width is limited at 900px because any larger size feels like the page has too much whitespace. I’ve also used rounded corners at the bottom of the page for a smoother effect on the eyes. Possibly the most crucial aspect of this online resume is the responsive functionality. I have five different breakpoints setup to achieve various effects when resizing the browser window. The initial 740px is right around where the photo image will clash with our header text. Instead of letting the photo drop-down onto the right side we clear both elements and center the whole layout. I’ve also increased the header text size to leave a more solid impact. As the window gets smaller I have removed some extra padding from the wrapper div and paragraphs. The next problem we run into after the header is from the skills UL listing. I break down the two-column approach and instead have list items floating next to each other. This also requires repositioning many of the default text properties. We have to update the line height and reposition each list item’s bullet icon. I’ve set a fixed width so the grid appears more organized until the next breakpoint. The last three media queries are small yet very important. As you switch between landscape and portrait mode the iPhone will resize any mobile browser. This is also the case with most Android devices and Windows Mobile phones. When first hitting 480px or smaller we remove some more padding from the wrapper and also re-size the list items again. Then at 320px I’ve removed some of the margin space outside the document. You can still see the textured background, but it’s not very important on such a slim vertical viewport. Lastly I’m using max-device-width to target the iPhone device itself, or namely any other mobile screen with a maximum width of 480px. In this case I want to update the list items a bit wider so that they fill in the whole screen. It will only affect the skills listings in landscape view since portrait is too skinny to notice any differences. Working over the Internet often requires at least some type of portfolio online. When you can link to a single page resume with all your details organized together it shows that you mean business. Serious employers and potential clients will fall head over heels for such a charismatic display of professionalism in web design. I hope you can take some key points away from this tutorial. Freelancers in any location around the world can market themselves with just a bit of technical effort. Feel free to download my demo source code above, and share your thoughts on this article in our comments area.